Back in the ’80s when I coded for a living, ‘marketing’ was something sharp-suited, hard-drinking Mad Men did. As far I was concerned, ‘marketing’ was about interrupting people with TV, newspaper and radio ads. Is that all marketing is? Annoying ads? What’s the goal? Does it work? I didn’t really know or care. I had real work to do, like building a product that was so great it would sell itself! Twenty-five years later I began to understand what marketing really is and the power of what it can do. Another 5 years on, here’s my take. 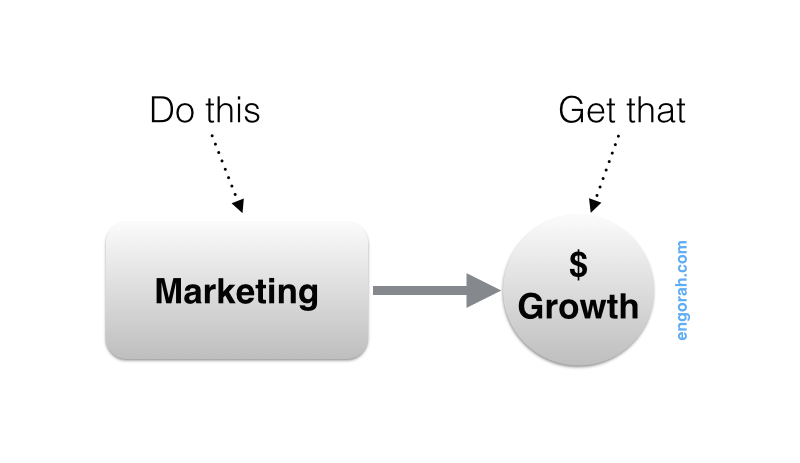 Ultimately, marketing is about growth. Specifically, revenue growth. Marketing is the process. Growth is the outcome. The irony is, chasing the money first doesn’t usually work. Many who’ve failed (or haven’t even tried) to build a business believe that making money is the purpose of a company. Marketing is the process of creating customers which in turn results in revenue. From every marketing activity, through to creating customers, and generating revenue. And, back from revenue, through customers, to marketing. This way, marketing is seen for what it really is: the means for generating and growing revenue. Marketing today is a complex interplay between psychology, creativity and technology. But, it rests on two basic interlocking frameworks that we’ll briefly review here: the marketing funnel, and the marketing mix. The basis of the classic marketing approach of funnelling people through stages from ‘awareness’ to purchase goes back to 1898. Many marketers seem to believe that creating fluffy awareness ad campaigns is an end in itself. Yes, they have a role but as a means to stimulating interest. There are of course many ways besides ads, to generate awareness including publishing your own media and by others doing it for you, e.g. over blogs, video, podcasts, social media, email, SEO, referral loops, etc. But in all cases the purpose of awareness is to stimulate interest. Now that you’ve caught someone’s attention, you can actively try to stimulate their interest, or you can just be there for when they are ready. The thing to bear in mind here is that it could take seconds, days, months, or even years between when someone becomes aware of you and when they become interested in what you have to say, do, or write. Managed properly, interest can spark desire. And for the marketer, turning interest into desire is the next step. Now that someone’s aware of you, and is now interested, your job is to try to trigger a desire in them for something you can help them with. Or, just be there for when they’re ready. Again, this could take seconds, days, months or years. 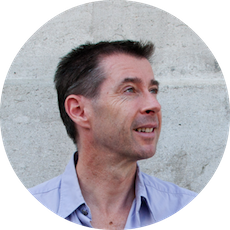 There are many techniques including the art & science of copywriting but the aim is to tap into someone’s desire and move them to action. Desire can lead to action. But, do you know what you want them to do? Pushing for purchase might not be appropriate just yet. Be patient. Small actions often lead to much bigger actions which can eventually result in a customer, and therefore revenue. An initial small purchase can pave the way to a bigger purchase. Ultimately though, without customers you don’t have revenue. And without revenue, you don’t have a business. What’s more, a business must keep generating revenue to stay in business. Even a lifestyle business needs to grow revenue just to keep-up with inflation. Around 1960, marketers began to use a framework known as the Four Ps. 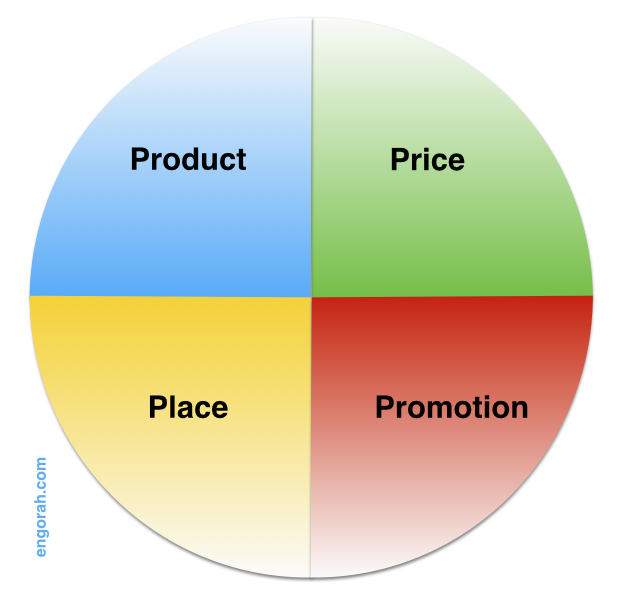 The idea is that effective marketing requires the right blend of product, price, place and promotion. Successful products exist to address a problem or desire for a customer. Customers don’t care about a product or features in themselves. They only care about what the product can do for them. The best marketing in the world can’t save a crappy product that no-one wants. Marketing can discover a customer’s problem (or desire) – that you can help them with. Marketing can point to a solution that then becomes a product or service. Marketing can translate between benefits the customer cares about and product features. Marketing can ensure that the right product gets built for, used, and shared by the right customer. Marketing can help you discover the right price for your product or service. The right price is related to the value perceived by the prospective customer. If your product costs $500 but is perceived to bring $300 of value to the customer you have a problem. But if your product is priced at $900 and is understood by the customer to be worth $6,000 of value to them, then you could be onto something. Marketing can discover where your customer hangs out. Online and off. Marketing can suggest and experiment with different channels until the right ones are found. Today, like all aspects of marketing this is an ongoing process. Not least because there are so many new channels popping up all the time, and your customers will switch into, out of and between them over time. Marketing is how you reach customers, and how they reach you. 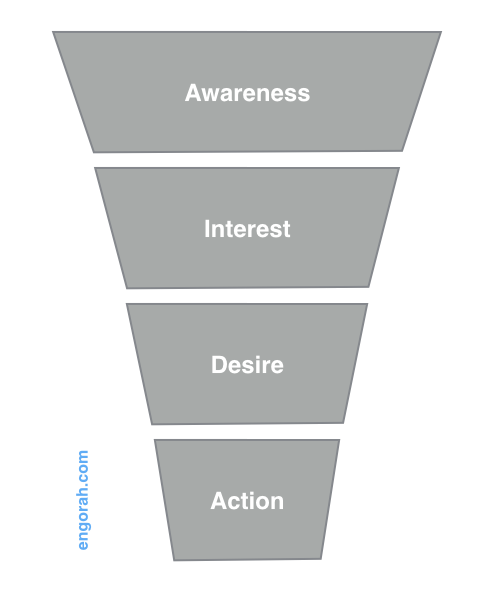 Marketing can use an AIDA-type funnel (or similar) framework to connect your product or service with your ideal customer. …or it can use a more decision-based approach like that proposed by McKinsey. …or any combination of these, or other equivalent approaches. Note: The basic 4ps framework of 1960 has evolved and become more sophisticated over the years but the core building blocks continue to provide a firm foundation. In the end there are only three ways to grow revenue. Given that revenue is a by-product of creating customers then as you’d expect these three things are all squarely within marketings remit. This is what marketers call customer acquisition. An acquired customer is one that has been receptive to the marketing mix, and has progressed through the marketing funnel. And that could take seconds, years or anything in between. A key source of customer acquisition is the referral. This is where ‘someone’ tells someone else about you and your product or service, who then goes on to become a customer. The ‘referrer’ could be a customer, but could equally be someone who is not yet a customer, or someone who may never become a customer. Either way, the referrer is someone who has experienced your marketing in some way. 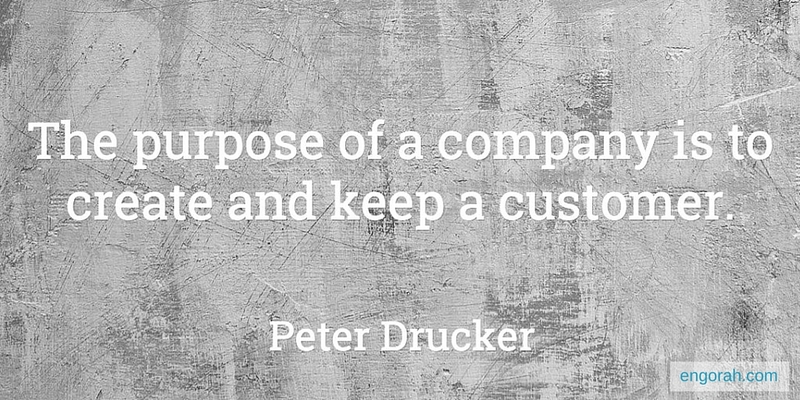 Keeping a customer is often, though not always, cheaper than creating a new one. The longer we can retain a customer the more revenue will result. Marketing doesn’t therefore end when a customer is created. It continues beyond the purchase, through all customer interactions with the company, its team and its products. The goal is keep the customer and thereby increase revenue. Increasing the price paid for a given widget is going to increase revenue. But sometimes, reducing the price will in itself lead to more purchases or repeat purchases and therefore a higher return over the life of a customer (or LTV – Lifetime Value). Think how offering 12 months of a SaaS service for an upfront all-in price equivalent to 10 months can lead to more sales as well as better cashflow. So the goal here is to ‘optimise’ price. Knowing your customer, getting your positioning right and sharpening your value proposition are all ways to optimise on price. But when I think back to when I was a programmer with no knowledge or experience of what marketing was actually about, I remember… I had no idea. Nobody ever told me. No-one at school, or college, or at any of the dozens of places I’ve worked over 30 years. Meanwhile, too many marketers are stuck in a campaign-mindset as if a) campaigns were all that were needed, and b) campaigns were ends in themselves. No wonder there’s so much confusion over the role of marketing, when so many marketers themselves seem to have forgotten what marketing is all about. Marketing is an ongoing process that starts before the product and continues beyond the sale. 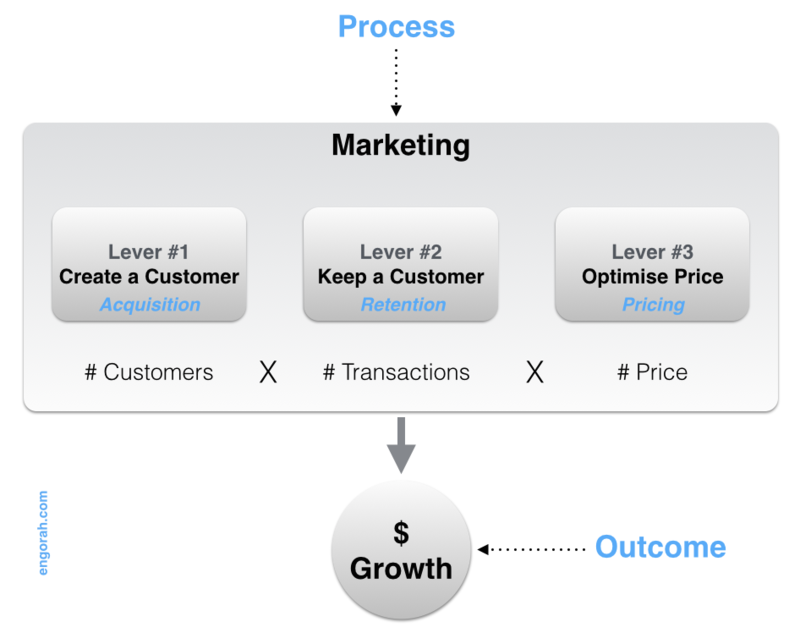 What’s more, it is the process that leads to revenue. Create and keep customers, at the right price, and revenue growth will take care of itself.